What Causes an Above-Ground Pool to Collapse? Because it consists of little more than an inexpensive metal frame and a vinyl liner, an above-ground pool is a great alternative to a built-in pool for budget-conscious homeowners. Unfortunately, however, above-ground pools can collapse. Frames are usually constructed from corrugated sheet metal, and while it's strong, sheet metal can't always withstand the extra weight of several inches of melting snow and/or ice. If the pool has been improperly installed on sloping ground, even the weight of the pool water itself can be enough to cause a collapse. Moreover, the metal fasteners holding the frame together don't last forever. They can corrode and fail. When that happens and the frame starts to separate, it doesn't take long for the worst to happen. Age, improper maintenance and poor installation can all put your above-ground pool out of commission. It's best to install your pool on a concrete pad, but many homeowners prefer to save money by instead installing the pool on pavers. This is an acceptable practice as long as the ground is flat, but it often isn't, especially when installers have leveled the ground manually. If the water level in the pool is higher on one side than the other, the frame can fail on the side with the higher level. According to one installer, the threshold difference is about 3 inches; less than that, and the pool is probably safe, but more than that, and a collapse is probable. When installing a pool on rocky or root-bound terrain, ensure that no rocks or roots are sticking up in the middle of the pad. Once you fill the pool with water, anything pressing against the liner could rupture it. Many do-it-yourselfers don't like to follow instruction manuals, but if you're installing an above-ground pool, that's a very bad habit. Framing kits come with a variety of screws and brackets, and if you misuse any of these parts, the frame won't be able to withstand the weight of the water. Go over the manual carefully and check all the parts before you begin assembly; then consult the manual again during assembly to make sure you're doing it right. You especially need the manual when installing the liner. Manufacturers usually package the liners in such a way as to make them easy to unroll -- as long as you do it in the recommended way -- and that minimizes the possibility of wrinkles when you attach the liner to the frame. Wrinkles can cause the liner to slip from the frame and spill the contents of the pool all over your backyard. Pool maintenance involves balancing the chemicals in the water and adding algicides and clarifiers when needed. When the pool is an above-ground one, maintenance also involves checking for loose or corroded fasteners on the frame and tightening or replacing them whenever necessary. When a screw starts to corrode, you can often save it by painting it, but it's safer to replace it. If you notice rust on the sheet metal frame, treat it with a rust inhibitor and paint it as soon as possible to prevent the frame from breaking down. When you shut down your above-ground pool for the winter, it's important to leave some water in it to prevent damage from hydrostatic pressure. However, the pool shouldn't be completely filled. 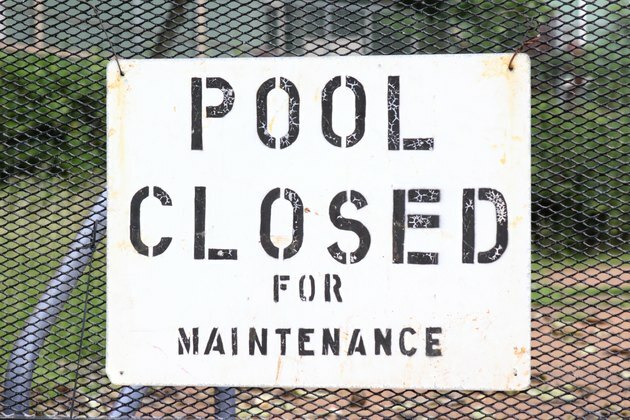 If it is, the expansion of the water as it turns into ice can push against the frame and cause damage that might not be apparent until you reopen the pool in the spring. To avoid this, drain the water to just below the skimmer and returns. Protect the plumbing lines by pouring pool-grade antifreeze through the return fittings and closing the fittings with threaded caps. During the winter, ice and snow will collect on the pool cover, and the extra weight can damage the frame and cause a collapse. Leaving air pillows in the pool before you cover it forces melting snow and ice to drain off to the sides instead of pooling in the center and putting pressure on the frame. If you don't use pillows, be sure to pump water off the cover periodically during the winter.